This course is designed for those individuals who currently hold a FAA Senior Rigger license or foreign equivalent or meet the experience requirements for a FAA Master Rigger license. This course focuses on the practical skills necessary for the Master Rigger license. 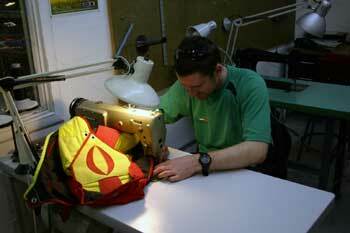 A qualified candidate will have the necessary packing experience as well as the basic sewing skills required of a Master Rigger. This course is primarily a finishing school designed to ensure that the candidate will meet the skills requirements and successfully pass the exam. 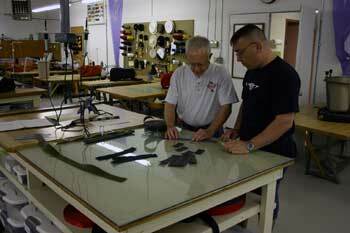 In addition, the candidate is exposed to a modern parachute manufacturing environment, with particular emphasis on the servicing and overhaul of modern parachute systems. An FAA Senior Rigger certificate is not a pre-requisite to obtain a Master Rigger Certificate provided the candidate meets the experience requirements as stipulated in the Federal Administration Regulations. A master rigger candidate will undertake major repairs and maintenance on canopies and harness/Container systems. In addition, they will be required to demonstrate experience in ram air reserve packing. The candidate must have the required number of pack jobs. All students are required to have the following books when they arrive for their training. Included in the course fees is a copy of the FAA Parachute Rigger Handbook (PRH) which will be provided to each student at the start of the course. Based on our experience, the FAA written exam stresses the candidate the most. If the candidate does not pass this test they cannot proceed to the Oral and Practical exam. IMPORTANT: Should the candidate FAIL the written exam, the cost to take the exam again is $175.00. We cannot stress STRONGLY enough the importance of preparing for this test. 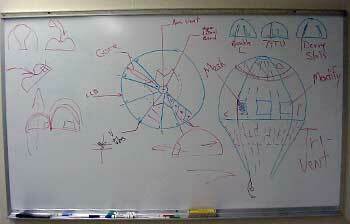 The candidate should study the "Parachute Rigger Study Guide". This will prepare the candidate with the knowledge to pass this exam. The following website link is another option to assist in your preparation for the written test. This website provides the parachute rigger test questions. However be advised that some of the questions have incorrect answers. We also recommend that you visit the FAA website and download a copy of the latest test bank questions for the Parachute Rigger. Test your knowledge before you arrive for your training. Candidates are evaluated at each level of training. At the conclusion of the training, each candidate meets with and is evaluated by the instructors. 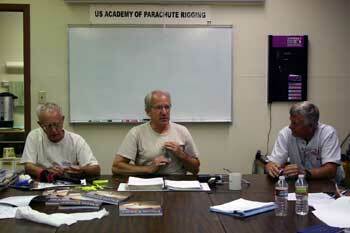 Each candidate will meet with the Chief Instructor for preparation for the FAA Written and Practical Exams. This includes a mock written exam based on a sampling of test questions by the FAA. A simulated oral and practical exam will also be completed prior to the scheduled appointment with the FAA DPRE. FAA Senior and Master Rigger Certificates are issued by the FAA DPRE after successfully completing an Oral and Practical Exam. The temporary Airman Certificate is valid for 120 days. The permanent Airman Certificate is issued by the FAA in Oklahoma City and mailed directly to the rigger. USAPR Graduate riggers also receive a USAPR Graduation certificate, Graduate T-Shirt, USAPR Rigger Wings and USAPR Coffee Cup. Students must provide 2 forms of photo ID. Must have recent ram air packing experience, main or reserve parachutes. 3 years experience as a senior rigger or equivalent military/forces experience. 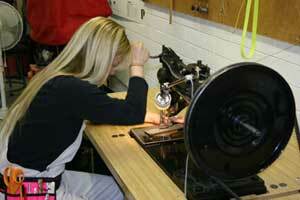 Military students without a rigger logbook will have to provide proof of experience. An original letter on a unit letterhead signed by the Commander or Supervisor will be required. Foreign Students with logged reserve packs must be supervised and signed by an FAA Senior or Master Rigger with the appropriate rating to be counted towards the 100ea of two types of reserve packs required by the FAA. An original letter with the supervising FAA Riggers address, certificate number and seal symbol must be included in the letter. Click here for all enrollment details. All applicants must submit a reservation application form to the Administrator for consideration. Submission of an application does not guarantee acceptance to the Academy. The Administrator will notify the candidate via email of acceptance to the Academy. Non-Military candidates require a deposit of US$500 is required to guarantee a reservation slot. The balance of course fees and exam fees are due no later than the first day of the course. The deposit must be received within 10 days of the notification. Military candidates should contact the Administrator for details pertaining to reservation deposit requirements. Payments to be made by credit card require completion of the USAPR Credit Card Authorization form. This form should be faxed to 520.466.2656 after receiving confirmation of acceptance to the Academy. Upon receipt of the deposit, candidates will receive a reservation confirmation via email outlining requirements and preparation for the upcoming course. **There are no fees for a reservation cancelled MORE than 60 days prior to the start of a course. **A cancellation notification LESS than 60 days but MORE than 45 days prior to the start of a course will result in a cancellation fee of $1000.00. **A cancellation notification LESS than 45 days prior to the start of a course will result in NO REFUND of fees. ** Approved refunds are processed within 14 days of written notice. A candidate may re-schedule for another course (one time) for a fee of $500.00 if made LESS than 60 days prior to the scheduled course date. A candidate must attend a rescheduled course within 12 months of the cancelled course. USAPR has no dress code requirements. It is recommended that candidates wear suitable clothing and shoes for the climate and work environment (packing on the floor). Candidates may bring their own knee pads. Travel and accommodation costs are NOT included in the course fees. Candidates are responsible for their respective travel and hotel accommodations. Make your reservations early. Click Here to find hotels near USAPR! USAPR course duration as published. The first day of the course candidates will complete a quiz, followed by Candidates introductions and facility orientation. Each day begins with a quiz. At the days conclusion, candidates gather in the classroom for the daily debrief. Candidates are not required to bring equipment or tools for their training. 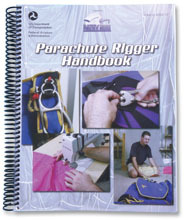 A complete Rigger Tool Kit is provided for the duration of the course.